El Dorado Maroma, A Beachfront Resort by Karisma provides a peaceful, private getaway amongst the beautiful Caribbean shore. It is the ideal resort for romantic escapes, weddings and honeymoons. 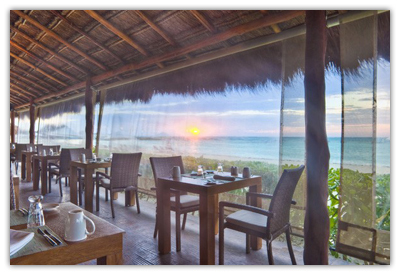 The resort is located on Maroma Beach, one of Travel Channel’s Top Ten Beaches in the World. 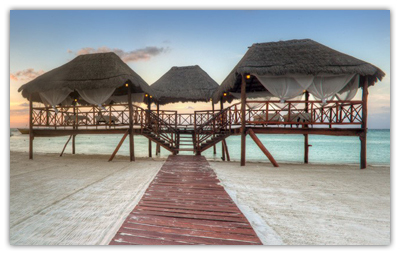 El Dorado Maroma is quietly tucked away on Maroma Beach, 30 miles south of Cancun. Located in beautiful Riviera Maya, there is never an idle moment, as there are activities to fill in every schedule. The historic treasures of Mayan ruins are as easily accessible as exotic wildlife. For the adventurer, scuba diving or zip-lining through the forest answer the ultimate adrenaline rush. The natural wonders of cenotes, caves, coves and white sand beaches allow a firsthand experience of nature’s endless beauty. For animal-lovers, the chance to swim with dolphins or ride horses along the beach shore is sure to prove exhilarating. Nearby Playa del Carmen offers retail therapy in its many craft, gift and jewelry shops. If the serenity of Maroma Beach is not enough, fast-paced Cancun offers the best in parties and nightlife. In the perfect tropical setting, relaxation is inevitable. The Spa at El Dorado offers soothing massages on the beach, aromatherapy treatments and detoxification procedures. The Spa also provides facials, body scrubs, and nail and hair services. The resort offers everything in accommodation from simple villas to an array of luxurious suites. At 2,760 square feet, the Beachfront Villas offer an ocean view and private butler service for in-room dining, or private moonlit dinners on the beach. For the more lavish in accommodation, the Royal Swim-Up Suite offers its own lazy river flowing in front of the suite. Infinity Pool Jacuzzi Suites provide a private terrace, infinity pool and an in-suite Jacuzzi. The romantic Honeymoon Suites include a separate living room, private deck and an outdoor shower. All standard suites include a king size bed, a coffee maker, a mini-bar, a fruit basket, wine selection, bathrobes, slippers, and plasma TVs with DVD players and satellite service. El Dorado Maroma features a variety of bars and restaurants to satisfy any appetite. Papitos Gourmet Beach Club, with its themed lunch menu, features an open kitchen and interactive dining experience. Sabores offers Mexican and Caribbean cuisine, including breakfast. For the more exotic palate, Kiyoko offers Japanese cuisine in an energetic yet intimate setting. This restaurant is perfect for larger groups. The romantic Mio Cuccina Italiana boasts traditional Italian dishes made with the freshest ingredients. It is the most popular of the resort’s restaurants. Bar 24 is one of two swim-up bars offering a variety of Mexican beers and made-to-order tropical drinks. Whether planning a beachfront wedding or an intimate vacation, El Dorado Maroma fulfills every necessity for the perfect vacation. One day can be spent swimming or sunbathing, while the next can be filled with adventure. There are a variety of rooms and suites with numerous amenities. The hotel is a TripAdvisor Traveler’s Choice Award winner, in addition to winning awards for sustainability. Put simply, El Dorado Maroma provides the essential vacation experience for everlasting memories.